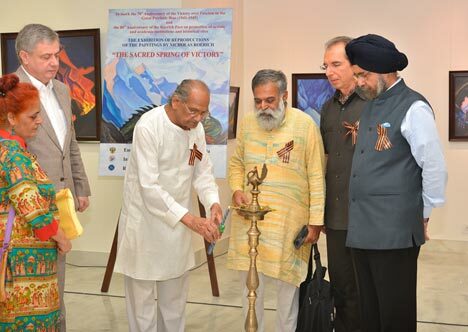 The exhibition of reproductions of paintings by Nicholas Roerich “The Sacred Spring of Victory” opened at the Russian Centre of Science and Culture (RCSC) in New Delhi on April 23, 2015. Organised jointly by the Embassy of the Russian Federation India, RCSC and the International Centre for the Roerichs, the event was aimed at marking the 70th Anniversary of the Victory over Fascism in the Great Patriotic War (1941-1945) and the 80th Anniversary of the Roerich Pact on the Protection of Artistic and Academic Institutions and Historical Sites. The exhibition was inaugurated by the Chief Guest Padmashree Mr. Ram V. Sutar, renowned Indian sculptor and President of All-India Fine Arts & Crafts Society (AIFCS). Hailing the noble efforts taken by the organisers of the exhibition, Mr. Ram V. Sutar said that the precious painting works by eminent Russian artist Nicholas Roerich remained a valuable treasure of art for future generations. An important highlight of the function was the St. George’s Ribbon campaign. The Ribbon constitutes one of the most recognised and respected symbols of military valour in Russia. The Ribbon consists of a black and orange bicolour pattern with three black and two orange strips. It appears as a component of many high military decorations awarded by imperial Soviet and current Russian Federation, including recently revived Order of St. George and the Cross of St. George Medal as well as the Soviet Order of Medal as well as the Soviet Order of Glory award. It is widely associated with the commemoration of World War II, especially with the units who were awarded the collective guard battle honours during the conflict due to the usage of a ribbon in the Great Patriotic War. Victory Medal was awarded to all the personnel, civilian or military who aided the war front. Tracing the background of strong bilateral relations between Russia and India, Mr. Sergey Karmalito, Senior Counsellor, Embassy of the Russian Federation in India, referred to the signal contributions made by the Roerichs family in building a solid cultural bridge between our two nations. Referring to Nicholar Roerich’s deep attachment to the Himalayas, he stated that the paintings spoke for themselves in this regard. Mr. Karmalito also underlined the great significance of the Roerich Pact. In his welcome remarks, Mr. Fedor Rozovskiy, Director, RCSC, described Nicholas Roerich as the first-ever cultural ambassador of Russia bringing the peoples of two countries much closer. He made an emphatic note on the all-time relevance and importance of the Roerich Pact. Pinpointing the depth and essence of each and every painting work by Nicholas Roerich, Mr. Suneet Chopra, eminent art critic, underscored the impact the works of art by the world’s renowned Russian artist had left on the minds of art-lovers.